Even if you have been living on Mars you will probably not have escaped the recent Scottish independence referendum, which provided the perfect opportunity to fill the schedules with speculation, debates, polls and documentaries. The centrepiece of the campaign was the 3 live TV debates, the first two between First Minister Alex Salmond and Better Together's Alistair Darling. My own view was that these heated, shouty debates would have done nothing to convince any 'don't knows' to choose a side, nor would they have convinced anyone to switch sides. 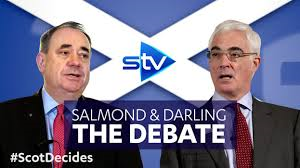 The 3rd debate, screened on STV, was perhaps the best of the three debates: it rested Salmond and Darling in favour of a multi-party political subs' bench and a wider range of views. However I am in no doubt that the mainstream media in this country chose to focus on negativity, gave us limited information and ignored a number of relevant arguments during the campaign, which (in my view) contributed to the No victory. Debates aside, what did a cross-section of the Scottish public think? BBC1 Scotland gave us "MIBBES AYE, MIBBES NAW" with a mixture of determined yes/no voters and a few undecided trying to be convinced/converted by their friends and colleagues. Due to my pre-holiday preparations I even managed to run up a backlog of "CZAS HONORU" (STV Glasgow). So we're now into series 2 and what do we know? Major Czeslaw was killed in the operation to spring Wladek from jail/hospital whilst Bronek must be very confused indeed as there's a new actress playing Wanda! You won't often find me watching/enjoying an ITV drama, but I am partial to these biography dramas from time to time. The BBC has previously broadcast dramas about Morecambe and Wise and also Kenny Everett, so ITV has obviously realised that there is some mileage in this game. Earlier this year ITV broadcast an excellent play "Not like That, Like This" with a terrific performance by David Threlfall in the role of Tommy Cooper, and the latest subject for a 'lorra lorra' dramatisation is Cilla Black. Sheridan Smith is excellent in the lead role of "CILLA" in the three-part series which ends tomorrow night. It's not complex or mindblowing by any means, and often boring in parts, but sometimes you just need to sit back and switch off for a while. I guess the same could be said for all the cooking/baking shows polluting the TV schedules. So if you've got a cake to bake and got no clue at all, just sit back and watch the experts. 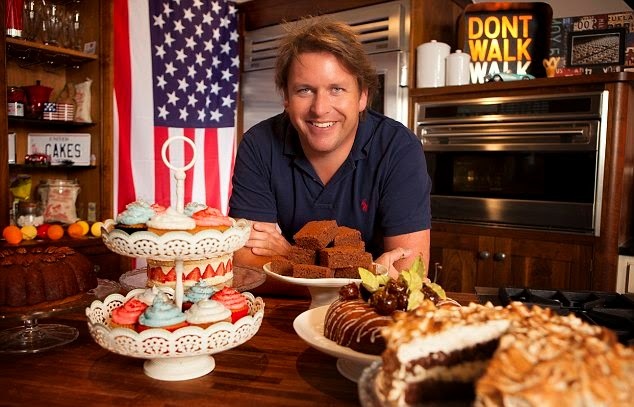 I always enjoy a mix of cooking show and travelogue, and caught up with a couple of them lately - "JAMES MARTIN'S UNITED CAKES OF AMERICA" (Good Food) saw the celebrity chef touring the bakeries of the U.S. east coast and checking out all the treats which they had to offer. 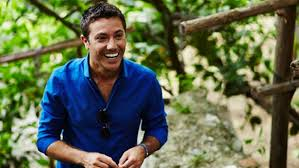 Meanwhile Gino D'Acampo's back with "GINO'S ITALIAN ESCAPE" (ITV) - what's not to like about an Italian chef, an Italian travelogue and Italian food? Oh and one more thing - I've just discovered "FAT - THE FIGHT OF MY LIFE" (Pick TV). 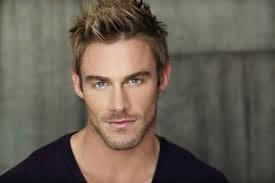 Can Jessie Pavelka come round and sort out my obesity crisis please?? Talent shows. 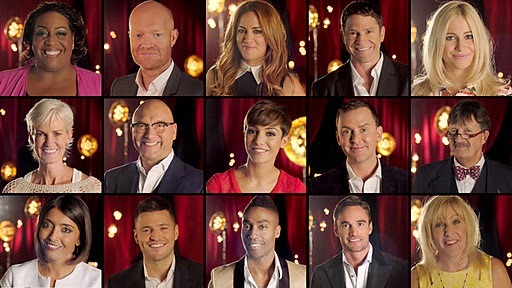 Let's face it, telly is bursting at the seams with wannabe singers. If it's not the X Factor - run for cover!! 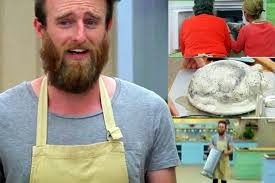 - or The Voice (which was OK for 5 minutes and then I've never seen a talent show go so stale, so quicly) then back in August, Channel 4 decided to put a new spin on it with "THE SINGER TAKES IT ALL" which was a cross between everything which has gone before, sprinkled with Alan Carr and copious mentions of apps. Oh how very 2014 of you Channel 4! We lasted one episode, which was one episode too many. Simon Cowell was probably rubbing his hands with glee as here, finally, was something which made X Factor look decent. Yes it was that bad. The dark evenings are here, and of course this signals the TV channels to bring out their big guns. X Factor. Strictly Come Dancing. Downton Abbey.....where are all the new ideas? Autumn telly's like groundhog day, isn't it? "STRICTLY COME DANCING" (BBC1) has had its traditional weekend double-whammy launch, kicking off this tedious, tiresome ratings battle with Cowell's never-ending tabloid filler. Of course there is no Brucie this year, as he's finally decided to hang up his keep-dancing shoes (he will return for Christmas specials etc though) and now Claudia Winkleman has been upgraded to Tess Daly's full-time presentation sidekick. There have been some significant changes to the professionals line-up: out go Artem Chigvintsev (now on the U.S. Dancing with the Stars), James Jordan (axed, while his wife Ola remains), and Anya Garnis (demoted to the choreography team) - welcome to the new arrivals Tristan MacManus and Joanne Clifton (sister of Kevin-from-Grimsby) whilst Trent Whiddon has joined the show as a late replacement for Robin Windsor who had to quit due to injury. Although I still enjoy the show, it must be said that after all these years - we are now in series 12 - its best days are behind it. The judging panel - now just a parody of themselves - are clearly only going through the motions, whilst on this opening weekend some of the professionals looked as if they'd rather be elsewhere. And then you can always rely on Dave Arch-and-his-fabulous-singers to mess up the hits of the day. But regardless of all this, I'll "keeeeep watching!" I distinctly remember back in the early days of "DOWNTON ABBEY" (ITV) reading somewhere that there were only going to be two series made, and then it would end. Great idea. Leave them wanting more. But this is not Denmark, and Downton has become an international TV juggernaut. After an unspeakably dull 4th series, the soapy drama of toffs and servants is now into series 5 and you wonder where it will all end. Another stale long-running dead horse being relentlessly flogged by ITV. I was so caught up in pre-holiday preparation, followed by a fantastic holiday (diary to follow shortly!) 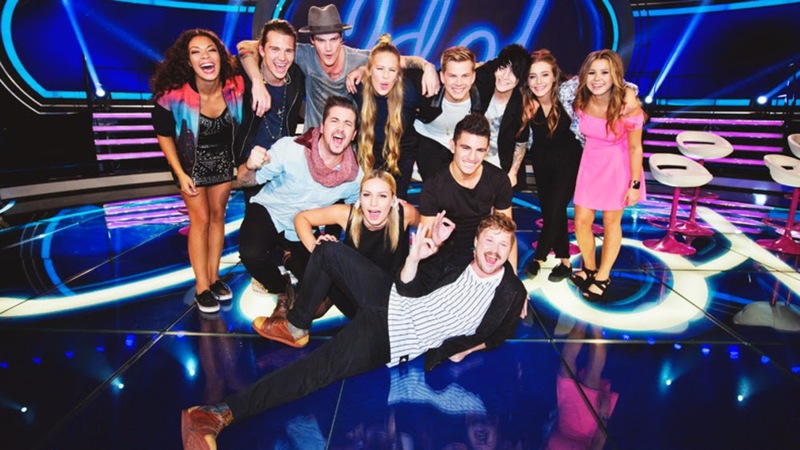 and completely forgot that the latest series of Swedish Idol is on the way. The elimination process is over, and the final 12 finalists are now known. I haven't seen or heard any of their performances yet so don't know anything about this year's contestant but I'm sure we will become very familiar with them over the coming weeks. Fanny De Aguiar, Lisa Ajax, Mollie Lindén, Niklas Musco, Petter Hedström, Philip Spångberg, Rolf Öhlén, Twyla Lidén, Charlie Diar, Matilda Gratte, Josefine Myrberg, Ludvig Turner. Who will succeed Kevin Walker in the 10th edition of the contest? Answers to follow!